I am in England for the second time this year doing research on the early history of Save the Children (1919), and the Declaration of the Rights of the Child (League of Nations 1924). The author of the Declaration, Eglantyne Jebb, dominates the history I am developing. I would like to recommend to our alumni a brilliant biography of this truly remarkable woman. 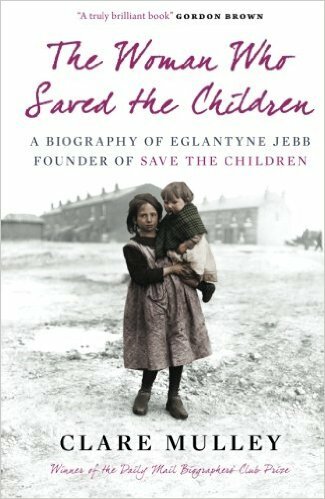 Claire Mulley's The Woman Who Saved the Children: A Biography of Eglantyne Jebb: Founder of Save the Children tells the life story of an extraordinary thinker and activist who should be enshrined in the pantheon of heroes of the twentieth century along with men like Mohandas Ghandi and Martin Luther King. Mulley's deeply researched and elegantly written biography reveals how the Great War 1914 to 18 created an opportunity for a heretofore unknown woman to seize the moment and organize one of the world's most important NGOs and launch the international movement for children's rights. You will find it hard to put this book down once started, and when you finish it you will never forget Eglantyne Jebb.